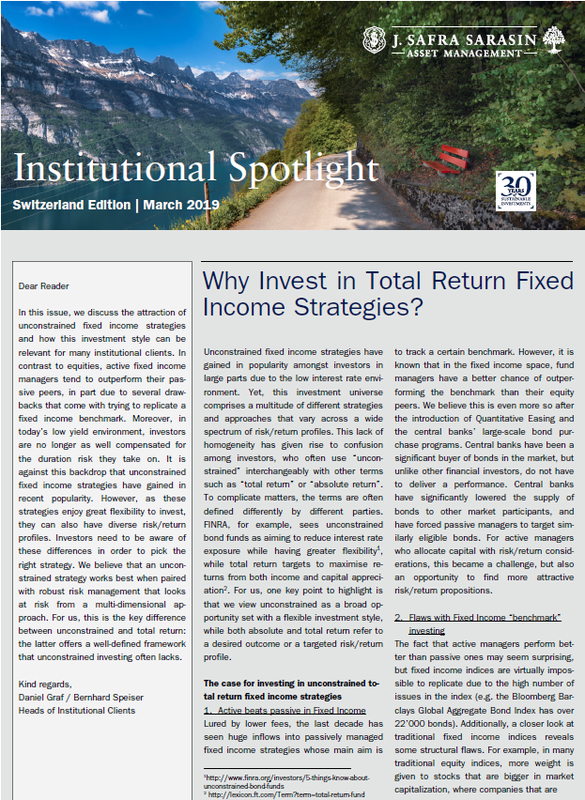 In this issue, we discuss the attraction of unconstrained fixed income strategies and how this investment style can be relevant for many institutional clients. In contrast to equities, active fixed income managers tend to outperform their passive peers, in part due to several drawbacks that come with trying to replicate a fixed income benchmark. Moreover, in today’s low yield environment, investors are no longer as well compensated for the duration risk they take on. It is against this backdrop that unconstrained fixed income strategies have gained in recent popularity. However, as these strategies enjoy great flexibility to invest, they can also have diverse risk/return profiles. Investors need to be aware of these differences in order to pick the right strategy. We believe that an unconstrained strategy works best when paired with robust risk management that looks at risk from a multi-dimensional approach. For us, this is the key difference between unconstrained and total return: the latter offers a well-defined framework that unconstrained investing often lacks.